Victor is an amazing 9-year old boy who has continued to persevere despite all odds that he has faced. In the fall of 2016 Victor arrived at Bethel, an incredible foundation which specializes in the care of children with vision impairments. Upon his arrival, they gave him the name “Victor” to symbolize his victories over the challenges he has faced so far in his young life. The caretakers at Bethel describe this amazing boy as an overcomer who is loving and joyful with everyone he meets. He has a curious spirit and always seeks to explore new places and new things. Victor loves his main caregiver very much, showing an incredible ability to attach and love others. He has been through a lot, but he continues to rise above those experiences and thrive with the love and care of the staff at Bethel. 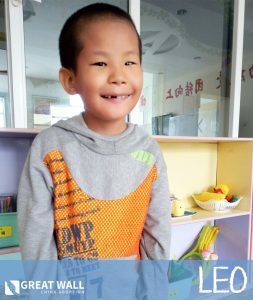 Victor loves to play, dance, and laugh with with his friends and teachers. He has significant vision impairment in both eyes, but he is able to see light and loves to play with toys that light up. Despite his vision impairment, Victor loves exploring and seeking new experiences. He has learned to trust others and feels safer and more secure with each day that he is at Bethel. Victor has made phenomenal progress since arriving at Bethel last fall, and we can only imagine what he will accomplish when he receives the unconditional love of a family. Bethel recently teamed up with The Archibald Project to share the stories of the amazing children in their care. Visit their website here or contact GWCA’s China adoption specialists to see what they had to say about Victor. We’re so hopeful that Victor will find his family soon. If you’re interested in learning more about this incredible boy or reviewing his medical file, please visit our Waiting Child photo listing or contact GWCA today!